Admission: Adults 15.50 Euros, Children 4-12 7.75 Euros. 10% discount when booked online in advance. One of the most relaxing and rewarding ways to get an overview of this city on the water is from the canals themselves. In under an hour you can get the lay of the land and have a better idea of what to devote more time to later, as well as where everything is. While this particular tour does not feature a live guide, the recorded audio tour is available in 19 languages and gives a nice overview of city history and culture. 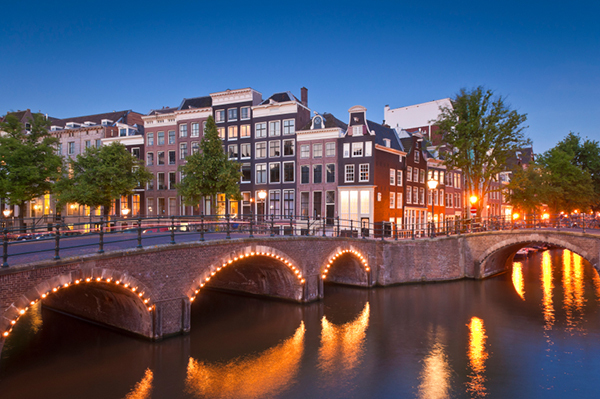 This is a simple, convenient and still fairly thorough introduction to Amsterdam. More in depth tours as well as specialty cruises are available, but Canal Company Tours’ signature outing is highly recommended, leaves often, is easy to find and family friendly. In case you are rushing here from a ship or a hotel in the morning, fear not as toilet facilities are available on board for that child that wasn’t quite sure when you left. Getting There: Just a 10 minute walk north of the canal tour. Public transportation will take as long but is an option if the ½ mile walk is too much. Sitting atop the Singel Canal in Amsterdam is the world’s only floating flower market. No matter what season you visit in, this series of gorgeous flower stalls set atop of house boats will overwhelm both your eyes and your nose. The beautiful and fragrant flowers include tulips, narcissus and other bulbs typical of the Dutch flower trade and way of life. The bulbs are cleared for export and can be brought home to plant and enjoy a bit of The Netherlands back in your own home. Besides the flowers there are other souvenirs and local fare, insiders recommend trying some real Dutch edam cheese for a sumptuous treat. Getting There: A 20 minute, 1 mile walk from the market or 10 minutes by bus. Vincent Van Gogh is one of the world’s most acclaimed and instantly recognizable artists. This museum is the single largest collection of the 19th Century Dutch Master’s works and contains over 200 paintings and 600 drawings. Art buffs will be in heaven here, while the uninitiated or simply very young will be able to follow as Van Gogh’s work is organized by period and a walk through the museum gives you a glimpse into the progression of his art and life. Guided audio tours are available for 2-5 Euros and there is a version aimed at children in addition to the standard adult one. As opposed to many European mega-museums, this is a smaller, easier navigated one which makes for a much more enjoyable and manageable experience when traveling with children. It also doesn’t hurt that they have air conditioning in the summer. Getting There: Bus from Amsterdam Amstel Station to Muiden/Muiderslot or ferry from Amsterdam IJburg. Trip is approx 1 hour. Admission: Adults 13.50 Euros, Children 4 – 11 9 Euros and under 4 are free. This UNESCO World Heritage site is a real slice of Dutch history as well as a breathtaking sight. About 10 miles outside the city of Amsterdam, it sits on the mouth of the River Vecht and is the nation’s best preserved castle. Besides being an impressive sight to behold it has set itself apart as one of the premiere family destinations in the area. It features real falconers giving live talks and demonstrations. Younger children will appreciate exhibits on medieval costumes and armor featuring pieces to try on so your child can literally step into the shoes of a knight or a princess and live a real life fairy tale inside a castle. Avoid the guided tour as they don’t currently offer one in English and you’ll just be given a card to read. In addition to the castle’s art and exhibits, the gardens are stunning and you are free to wander them at your leisure and just relax. The ferry ride back and forth is an enjoyable experience in itself as beverages are available as you take in beautiful water views. Getting There: Reverse the last route by taking ferry back and bus or two buses. Admission: Adults 9 Euros, Children 10 – 17 4.50 Euros and Children 9 and under are free. Known to locals as “Anne Frankhuis” this somber yet fascinating locale in the heart of Amsterdam is a museum unlike any other. This is the actual house where a young Anne Frank and her family hid from the Nazis during World War II. This is where she wrote her famous diary, a book known the world over (translated into over 60 languages) and adapted into plays and films, it depicts perhaps the most well known story of Jewish victims of the Holocaust. This very special museum preserves much of the house as it was when she was there and allows you to literally step into her world and experience the history where it was made. This is obviously a very emotionally heavy destination. Parents will want to use judgement bringing younger children and need to take time to prepare a child of any age for what is inside. Spending some time on the museum site or, better yet, with the book before visiting will ensure you get the most out of your time here. Bear in mind that there are narrow hallways and plenty of stairs you will need to be aware of when travelling with young ones. Also note that the lines here get long. You can book ahead and skip the line. If you opt not to do this try to arrive either early in the morning, before or just after the museum opens, or else hold off until after 4 PM to avoid the longest waits.